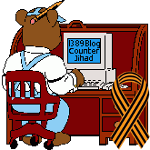 Treason: Obama is arming al Qaeda — 1389 Blog - Counterjihad! As a military veteran, I was disgusted to hear that President Barack Obama has decided to provide weapons to the Syrian rebels. This sounds like Afghanistan II. Here we go again, arming and aiding so-called “freedom fighters” such as we did in Afghanistan with the mujahideen and now we are fighting them as the Taliban. What is really going on in Syria is an ancient war that dates back some 1,400 years to the beginning of Islam. This is the continuous bloody Muslim conflict between Sunni and Shiite. There are numerous reports that radical Sunni Salafists from around the world have joined in the fight in Syria. These are not “freedom fighters,” this is al-Qaida or groups connected to al-Qaida. Obama is arming our enemy and it is despicable. We helped similar so-called “freedom fighters” in Libya, and what happened? They attacked our embassy consulate in Benghazi and killed our ambassador and several others. The weapons Obama is giving to the Syrian rebels may one day be used against Israel or even our own troops. When is our government going to wake up and stay out of these endless Muslim wars? As a military veteran I was disgusted to read on the frontpage (Globe, June 14, “US to furnish military aid to Syrian rebels”) that Obama has decided to provide weapons to the Syrian rebels. This sounds like Afghanistan II. Here we go again arming and aiding so called freedom fighters such as we did in Afghanistan with the mujahdeen and now are fighting them as the Taliban. What is really going on in Syria is an ancient war that dates back some 1400 years to the beginning of Islam. This is the continuous bloody conflict between Sunni and Shia. There are numerous reports that radical Sunni Salafists from around the world have joined in the fight in Syria. This is Al Qaeda or groups connected to Al Qaeda. Obama is arming our enemy and it is despicable. 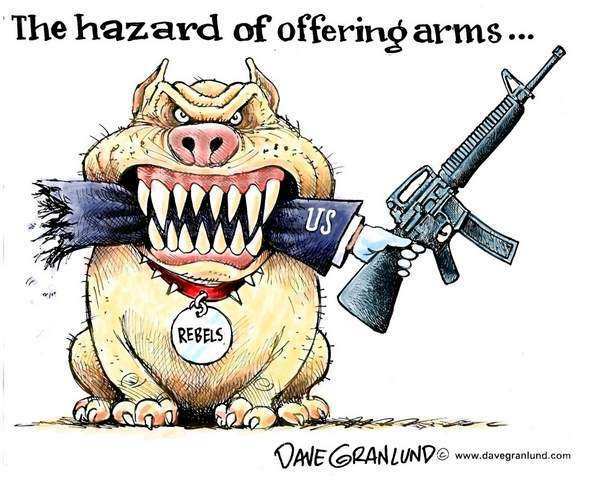 The weapons he is giving to the Syrian rebels may one day be used against Israel or even our own troops. I enjoyed reading John Meinhold’s letter to the editor titled “Arming rebels in Syria looks like Afghanistan II,” in the June 15 edition of the Portsmouth Herald. The West is playing the same dangerous game in Syria, as it did in the former Yugoslavia, by supporting religious extremists — particularly Islamic extremists — in the view that the “enemy of my enemy must be my friend.” As a result, the desperate, illegal and unilateral interventions in Syria, Libya, Yugoslavia, Egypt, Afghanistan and elsewhere by Western powers are destroying nations (and international law), and creating religiously fanatical and ethnically “pure” banana republics in their stead. This is causing tremendous instability throughout the world and may lead to World War III very soon. Considering that our nation is still in the midst of a horrible economic crisis with nearly $17 trillion of debt, we can ill-afford yet another expensive and illegal intervention in a faraway nation. The tweet includes a link to a post dated Dec. 4, 2012, on LaRouchePAC.com, a website that promotes the ideas of controversial presidential candidate Lyndon Larouche. “Exclusive: Terror is striking the #USA and #Obama is Shamelessly in Bed with Al-Qaeda,” the tweet — published around 12:30 p.m. PT to 60 Minutes’ twitter feed and then re-tweeted on 48 Hours’ feed — reads. Even though I take an exceedingly dim view of Lyndon Larouche and anyone who works with him, anybody who regularly reads the evidence presented on 1389 Blog will readily agree that Obama is indeed shamelessly in bed with al Qaeda. He’s also in bed with the umbrella organization, a/k/a the Muslim Brotherhood. Previous post: Canada: A vote on Bill C-304 is imminent! Time to scrap Section 13!